Sunbury Antiques Market held at Kempton Park is the largest and longest running market in the country. 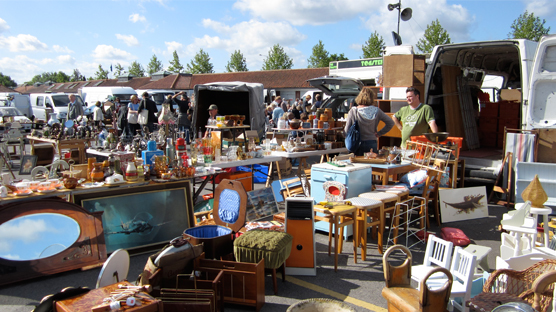 The 700 stalls feature traders from all over Europe - it sure is a vintage enthusiast's dreamland. This was my first ever visit to Britain’s most famous bi-monthly flea market and when we arrived I did a kind of little jig on the spot as I couldn’t decide which direction to go in first. My friend goes there on a regular basis to source vintage jewellery to adorn her beautiful handmade headpieces so she was straight down to business. I decided to stay outside where all the huge vans are parked up with their wares spilled out all over the show. It was kind of like a one stop shop of everything and anything your vintage heart desires. I really didn’t want to leave. They have a website here. SO on my list to visit very soon! We love Kempton and sell our upcycled items there. Come and chat with us -we are three or four vans down from the yellow toastie van towards the stadium. If you don’t spot our vintage/retro wares your sure to find something in the sea of vans! PS – Get there as early as you can to get the cream of the crop and the best bargins!